Hindered by the hostile environment of Bologna, Malpighi accepted (November 1662) a professorship in medicine at the University of Messina in Sicily, on the recommendation there of Borelli, who was investigating the effects of physical forces on animal functions. Malpighi was also welcomed by Viscount Francavilla, a patron of science and a former student, whose hospitality encouraged him in furthering his career. Malpighi pursued his microscopic studies while teaching and practicing medicine. He identified the taste buds and regarded them as terminations of nerves, described the minute structure of the brain, optic nerve, and fat reservoirs, and in 1666 was the first to see the red blood cells and to attribute the colour of blood to them. Again, his research and teaching aroused envy and controversy among his colleagues. Malpighi's work at Messina attracted the attention of the Royal Society in London, whose secretary, Henry Oldenburg, extended him an invitation in 1668 to correspond with him. Malpighi's work was thereafter published periodically in the form of letters in the Philosophical Transactions of the Royal Society. 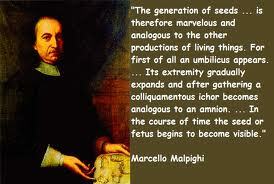 In 1669 Malpighi was named an honorary member, the first such recognition given to an Italian. From then on, all his works were published in London. The definitive study of Malpighi is Howard Adelmann, Marcello Malpighi and the Evolution of Embryology, 5 vol. (1966). It contains a complete biography of Malpighi, translations from the Latin of Malpighi's chief works with Latin on facing pages, colour reproductions of Malpighi's illustrations, and detailed essays on structure based on embryologists of the 17th, 18th, and 19th centuries with extensive translations from French, German, and Latin. Ettore Toffoletto, Discorso sul Malpighi (1965), provides a critical analysis (in Italian) of Malpighi both as a man and as a scientist.